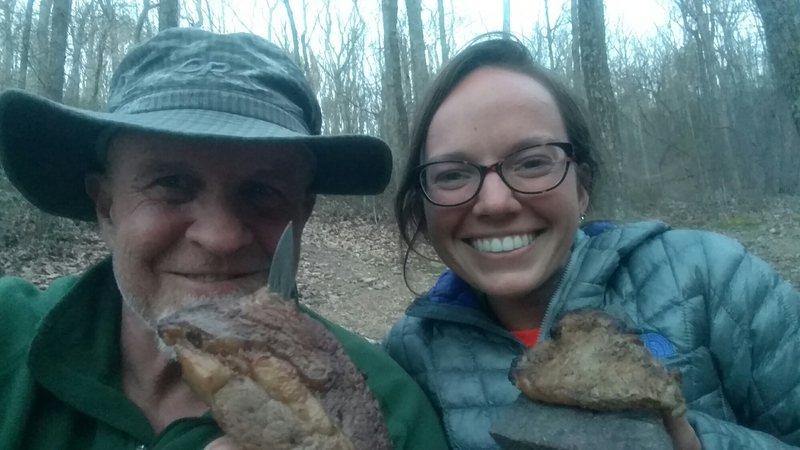 A Section hiker shares a STEAK! We’re 62.1 miles into our flip-flop thru-hike and Shrek, Scout and I (Chopper) ran into “Fisher” and “Ramblur” at the shelter. “Fisher” had just gotten a ride into town and hit our shelter with 2 steaks, 5 sausages and a bag of shrimp…..which he SHARED!!!! TALK ABOUT OMG……OMG! After ramen, rice and potatoes with packaged meat, tonight was quite the feast! 2 days until our resupply by Vino (aka “Sir Packs Alot) and his wife Karen….. Since we last saw him at Matt’s Creek Shelter where he planned to hang out until getting picked up at the James River Footbridge by his wonderful wife Friday afternoon. They’re meeting us Saturday morning at the Pizza Hut in Daleville to resupply us for week 2! Praying for the three of you every day. Looking forward to future updates. Love you guys. Thanks Patti, with some sketchy (cold & wet) weather headed our way, we can use all the help we can get! Shrimp, sausage, steak, Pizza Hut? Craig told me you guys would be roughing it for the next few months! The dinner fixins by Fisher were quite the surprise! Between Scout, Shrek and I, we shared 3 sausages, a ribeye steak and maybe 6-8 shrimp….it was awesome! Looking forward to breakfast somewhere and resupply tomorrow…and a couple malts for me and Scout. 5 miles hike in and another 9 when we get dropped off…. Long day, but a happy one! Hey Duke, Sounds like all is going well especially if you are eating steak and shrimp. Good luck with the next leg of your journey. Thanks for blogging. Thanks for following Helen! Without people to read my blog, it’s kinda a fuile gesture, so THANKS and keep following!! Tomorrow is our first Hostel day and hot showers, clean clothes & a bunk!!!! Duke, I’m living vicariously through you. Can’t wait to read of your adventures. I taught about Lewis and Clark the other day. I was telling my students about the Appalachian Trail and some tales a friend had told me when she hiked it years ago. Thanks Carol, today was a doozy with temps in the 30’s and sleet at the top of the ridge with some slick Rock scrambles and our longest day yet at 14 miles! Every day has its own unique challenges. It makes me think of some of our beach days….and right now, I’m missing them with this cold weather. Say hi to the rest of the family and keep following along;). I try to answer when I can! Love reading your blogs. I too am living vicariously through you. I am so excited for you guys. What an adventure of a lifetime. You all in my prayers. Tell Kelsey to watch out for the owls. teehee. Love you guys. Be safe. Yes, I heard the story of Greyhound thinking it was coyotes from her momma’s facebook post. Go Duke Go. I admire you for taking on this awesome task. And I appreciate you following my posts! Week #2 is done tomorrow and we have another 83 miles going into the books to go with the 88 from week 1. We decided to get a night in a real bed tomorrow night at the Douglas McAurthur Hotel in Narrows, Virginia. Next week we’ll go over 220 miles, which will represent 1/10 of the entire AT trail! 1 step at a time girl, 1 step at a time.